We interviewed Brett Morrow, owner of Jumpin’ Fun Sports in Sarasota, Florida, a five star rated trampoline park. Jumpin’ Fun Sports just had a 2 year anniversary and has 13,000 square feet of trampoline surface in a 26,000 square foot building. BEAM: So what does Jumpin’ Fun Sports do? Brett, Jumpin’ Fun Sports: Jumpin’ Fun Sports started out as an open jump space with birthday parties and hosting field trips and groups in the summer. 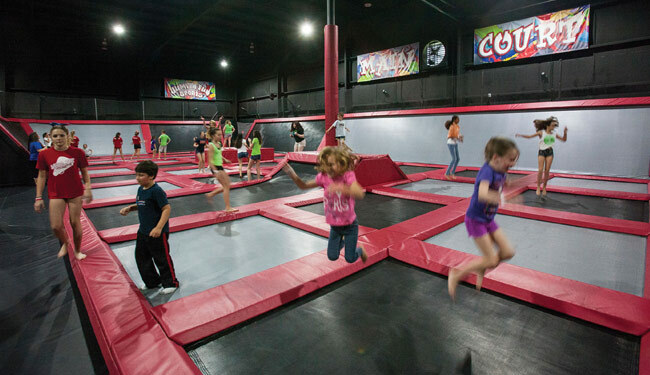 Then I saw the evolution of trampoline parks into family entertainment centers, we started to add more components to complement the entertainment experience at Jumpin’ Fun Sports. we added a sports simulator, a 26 foot rock climb, a four person gyroscope ride, a pretty elaborate audio visual system, and then saw BEAM interactive playground as something to complement the business model at Jumpin’ Fun Sports. I thought it would be interesting to bring that in and offer something to the 2-12 year olds, who are the most engaged in the product. They use it to entertain themselves prior to their jump time, or during, if they get weary and want to come over and try their foot at it for a while. Also when their jump time’s over, they’ll give the soccer ball one last kick. And our birthday parties, in between sitting down and waiting for cake, they’ll run over and try it. I don’t charge for it. It’s just a value-added to the experience. And parents are entertained and appreciate the accessibility, too. BEAM: What was the goal when you got it? Brett, Jumpin’ Fun Sports: Just to add another fun feature. I had a space where it would fit nicely. I just wanted to give my patrons another piece of fun. BEAM: What’s the measurable benefit? Brett, Jumpin’ Fun Sports: We get verbal feedback from customers. We get positive comments all the time. They like BEAM interactive playground because it’s active, and because of the ease of use, and the interactive nature of the activity. Some of the younger kids can stay on there for 15-20 minutes at the time. They’re occupied, but with movement, and it’s not just some video game. And we can see that there’s people on it at all times throughout the day, moving their feet and having fun. It engages patrons and sets us apart, which means they’ll be back. It’s all about the experience, and our numbers are good. We have lots of return guests, so they’re enjoying themselves. And that’s what we’re trying to do, at the end of the day, to be the number one source of family fun and fitness in Sarasota and Manatee County. BEAM: What’s the maintenance and upkeep like for the unit? Brett, Jumpin’ Fun Sports: The most we have to do is, occasionally, a light scrub or cleaning of scuff marks from people with shoes on with black soles. Other than that, it’s been pretty maintenance-free. Vince in your corporate office is always available for any questions and help. He was instrumental in getting it set up. I just think it’s a valuable offering in any indoor entertainment business that promotes active fun.